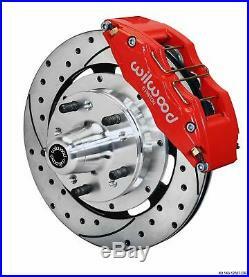 Dynapro 6 Big Brake Front Brake Kit (Hub) SRP 12.19 Drilled and Slotted Rotor / Red Powder Coated Caliper. This kit will move your wheels out. 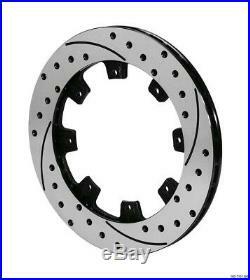 Fits the Following cars with Factory Disc Brake Spindles. Pair of Ultralite SRP 12.19 x. 81 Drilled and Slotted rotors - Vented for proper cooling. Pair of Rotor Adapters with Bolts. Aluminum Wheel Hub - Includes 5 x 4.5 and 5 x 4.75 Bolt Pattern. NEW pair of Heavy Duty Dynapro Red Powder Coated 6 piston Calipers. Full set of Semi-Metallic pads Wilwood BP-10 Pad Compound great for street use and light track use. All necessary hardware (nuts bolts). DynaPro 6 forged billet calipers are combined with 12.19 diameter rotors for this group of traditional non-ABS spindles on American muscle cars and vintage rods. The enhanced brake capacity and pad performance of the six piston calipers provide an intermediate level alternative to the bigger six piston kits. These kits compliment wheel, tire, and suspension upgrades on all types of custom show and high performance street / strip machines. A full range of caliper finishes and rotor designs enable the builder to personalize the style and optimize the brake performance for each individual application. Dynapro 6 Piston Lug Mount Caliper. The DP6 marks a noteworthy step in the evolution of the DynaPro caliper series. DP6 calipers offer the performance advantages of a larger pad and a six piston differential bore configuration, with complete bolt-on interchange ability to the four piston 5.25 lug mount DynaPro models, and the long standing Dynalite caliper series. As with the previous DynaPro models, the strength of the DP6 is a combination of process and design. Premium grade alloy billets are stress-flow forged resulting in a highly efficient, high strength body. Stress flow forging re-aligns the internal grain structure of the metal within the contour of the caliper body. This process is proven to provide superior strength over any other process derived from castings or straight billet block machining. FEA assisted solid modeling design technology was employed to find the optimum balance between lightweight with superior strength against deflection and body separation under high load. In addition to the sturdy, yet stylish body, the DP6 incorporates race proven technology and the latest Wilwood performance enhancements. Pad clamping force is generated by six heavy wall stainless pistons configured in a leading to trailing edge differential bore pattern. The heavy wall pistons have been re-engineered to fully resist backside deflection at high pressures while maintaining balanced pad loading for even wear over the length of the pad. Stainless steel resists corrosion while inhibiting direct heat transfer from the pads to caliper body, seals, and fluid. Two choices for overall piston volume provide options to match caliper size with master cylinder output and bias requirements. The DP6 uses the upgraded type 6712 pad that provide the larger overall volume size from the previous Dynalite and DynaPro four-piston models. The pads are retaining with exclusive Wilwood Quick-E clips for simplified pad service and maintenance without caliper removal. Stainless steel SRS bridge plates are used to dampen engagement harmonics, eliminate pad rattle, and protect the caliper bridges from gouging by the pad edges. Four corner bleeds and internal fluid passages accommodate front or rear mounting and simplified gas evacuation regardless of mounting position. Standard DP6 calipers feature a high gloss red finish. Piston Area (in²): 5.06. Brake Pad Area (in²): 7.3. Brake Pad Volume (in²): 2.4. SRP Drilled and Slotted Rotor. SRP Drilled Performance Rotors feature a specially engineered directional cross drill and face slot pattern that improve brake response and pad performance throughout the entire range of light to heavy braking. The venting and cleaning action of the holes and slots will reduce pad glaze and disperse gasses and heat generated during the pad to rotor interface. The holes and slots also inhibit irregular pad compound build-up on the rotor faces resulting in smoother engagement and improved pedal response in all conditions. The material removed also contributes to lower rotating and unsprung suspension weight. Along with the excellent performance characteristics of this rotor design, each rotor is treated with a black electro coat to inhibit corrosion on all areas of the rotor. The high tech design, classic style, and aesthetic appeal of the SRP series are the perfect finishing touches to any wheel and tire detail. SRP rotors are available in all popular sizes used in Wilwood's Pro Series and Big Brake conversion kits. Kits in these categories designated with the drilled rotor option get the SRP as standard equipment. Premium grade, medium weight castings. Suitable for moderate temperature racing to street use. Surface Finish: Drilled and Slotted. Rotor Bolt Circle (in): 8 x 7.00. Rotor Mount Hole Size (in): 0.326. Lug ID / Registration (in): 6.38. Far Side Inside Diameter (in): 8.56. Options and Upgrades Please see our other items. To see all the options for this kit. Stainless Steel Braided Flex Hoses Wilwood Kits do not include a Flex Hose from your brake line to caliper. Save your self endless hours of searching for a correct hose and order a set of Stainless Steel Braided Flex Hoses. 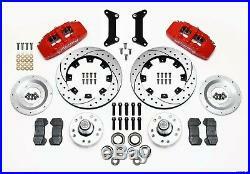 To see rear disc brake kits. Thank you for shopping at Matts Classic Bowties. The item "Wilwood 78-88 Monte Carlo Front Disc Brake Kit 12.19 Drilled Rotor Red" is in sale since Wednesday, March 15, 2017. This item is in the category "eBay Motors\Parts & Accessories\Vintage Car & Truck Parts\Brakes". The seller is "mattsclassicbowties" and is located in Camarillo, California. This item can be shipped to United States.